Do you need more info ? Leave your e-mail address. We will send you full information about this product. Ready for use one component, MS Polymer® based adhesive for insulated glass bonding. This product is intended for professional use only. Product can be easily applied by using manual dispensing guns as well as industrial adhesive dispensers. 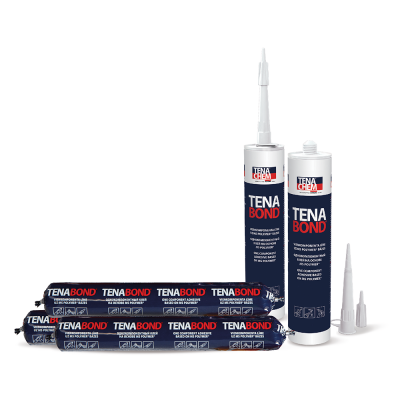 Compatible with all insulating glass sealants TENAGLASS. For the use of the product in combination with other sealants the approval from manufacturer`s technical department is required. Adhesive cures in the reaction with air moisture. After curing it has good strength-strain properties and excellent adhesion to glass, PVC and other polymer materials, wood, metals and to all secondary sealants TENAGLASS. Product is packed in 600 ml laminated foil sausages or in 290 ml cartridges. Supplied in cardboard boxes. One box contains 15 sausages or 24 cartridges. Special packaging in drums on request.